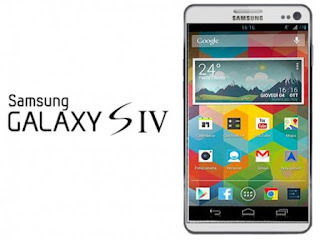 Samsung has just released a new smart phone Samsung Galaxy S4 on March 15, 2013 in New York. Samsung Galaxy S 4has a thinner dimensionof the Samsung Galaxy S 3 with 7.9mm bezelor frame plusscreen is also smaller, so as to present a wider screen. Its weight islighter, only 130 grams. Which makes it even cooler, Samsung Galaxy S 4wrapped with the body made ​​from lightweight polycarbonate famous and powerful - an ingredient that is also used to make fighter. The screen is almost makes a phablet - measuring 4.99inches Super AMOLEDtechnology that has a Full HD resolution of 1920 × 1080 pixels. This screen uses the new PenTile matrix andhas a density of 441ppi. When compared with other vendors' flagship, the density Galaxy S4 was on the LG Optimus MPro (401ppi) and on par with the Sony Xperia Z. International version of SGS IV processor will have 5Octa Samsung's Exynosquad-core Cortex-A15 speed 1.6GHz, quad-core 1.2GHz Cortex-A7 speed and GPUPowerVR SGX 544MP3. While other versions are marketed in certain countries, Samsung Galaxy S 4 is equipped with a processor from Qualcomm kindSnapdragron 600 quad-core Krait GPU Adreno300 plus 320. Even so both will be available in versions powered by4G LTE and2GB of RAM. 13MP camera on the back side will also compete directly with the two rivals, LG OptimusPro and Sony XperiaG Z. However,2.1MP front camera on the Samsung Galaxy S 4 has many new features thateye-tracking and hand tracking. Both camerascan take video up to Full HD. In a launch event demonstratedthat the addition of sound Samsung added a feature which, although photos do not move you make, but you can add a short sound like a greeting, thus making it more alive again. 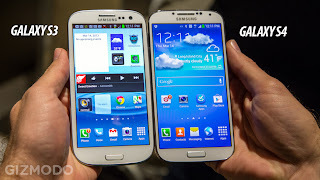 A Samsung Galaxy S4 is one of the most awaited new smartphone presences. With top-grade hardware components, many of those made ​​curious by the performance. This new product is very powerful because it can detect the movement ofthe face and eyes. The performance S4 Galaxy worth compared to other smart phones. Primate Labs tried to find the answer through a series of test capabilities (benchmark). In a test of skills cited by Android Community, Galaxy S4 version of the United States (U.S.) paired with a number of other advanced smartphones, namely HTC One, LG Nexus 4, BlackBerry Z10, iPhone 5, Galaxy S3 (United States and international version) from Samsung itself. For your information, the U.S. version of the Galaxy S4 is different from the international version. The U.S. version of the Galaxy S4 using 4-core processor Qualcomm Snapdragon 1.9 GHz speed 600, while the international version of the Galaxy S4 uses an 8-core (4 +4) 5 Octa Samsung Exynos 1.6 GHz speed. 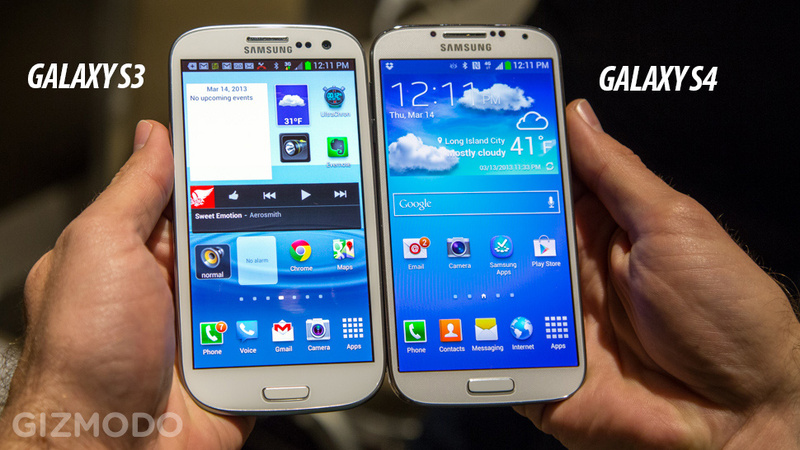 Samsung Galaxy S4 has a larger screen that is 5 inches longer and 4.8 inches like the Samsung Galaxy S3. The screen also looks brighter and sharper because it uses the Super AMOLED screen with a resolution of 441 pixels per inch. This makes the words easier to read and more detailed picture. Now Apple's 326 ppi Retina display has a new rival. Now smartphones from other leading brands will have heavy competition from Samsung. Apple with its iPhone 5 as well BlacBerry Z10 will compete with Samsung's Galaxy S4. Sony, HTC and many other brands have to be alert and enhance the features and capabilities of their products, of course with a more attractive price. Are you ready to replace your old smartphone with Samsung Galaxy S4?